MOD IS RELEASED TO THE PUBLIC!! PLEASE POST ANY COMMENTS FOR FUTURE MOD DEVELOPMENT. 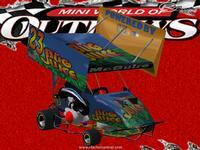 Based on the QRC Mini World of Outlaws Open Class kart. "The QRC caged kart concept began in the early 1980’s and was based solely on the need to go oval kart racing in the safest possible manner. As the first manufacturer to mount cages on karts some things were improved upon by trial and error. What started out as a rigid cage bolted directly to the lower frame soon changed to what is now called the floating cage. Movable receivers were added to the frame allowing the cage to rest on springs thereby freeing up the kart to flex. Wings were added to the cages right from the start as an additional safety measure and to protect the cage area in the event of a flip. 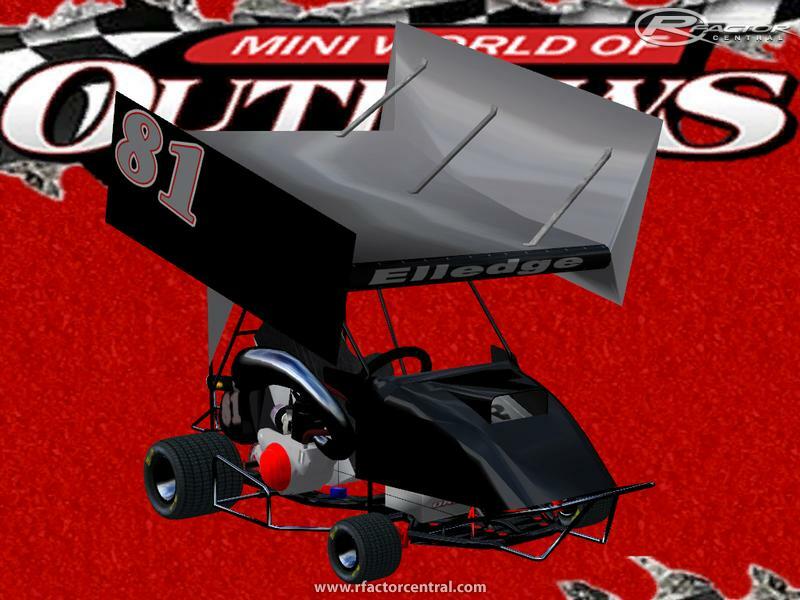 Wings feature the same curved belly design as used in sprint car racing. 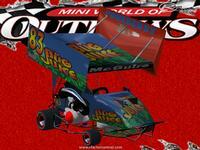 All of the karts now come equipped with rear axel adjusters that can lengthen or shorten the wheelbase. By sliding the bearing carriers front or back Open karts become adjustable from 40”-43”. This allows for quick setup changes while going from longer or shorter tracks and makes these karts adaptable to many surfaces and track conditions. 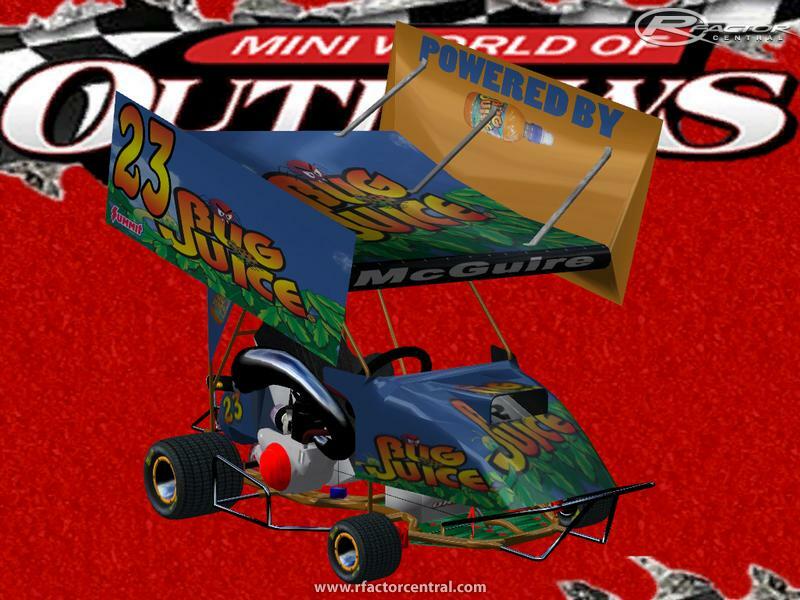 For the first couple of years a 2-stroke 250cc became the maximum engine displacement of the outlaw kart. But by 1987 the engine in the top class had been opened up to be unlimited in size as long as it was a motorcycle engine. The Honda 500cc 2-stroke became the engine of choice and still is today. Along with that came an engine that put out 85-100 horsepower on a 265 pound race kart. As a comparison, a Nextel Cup Car generates about 800 horsepower on a 3200 pound race car. 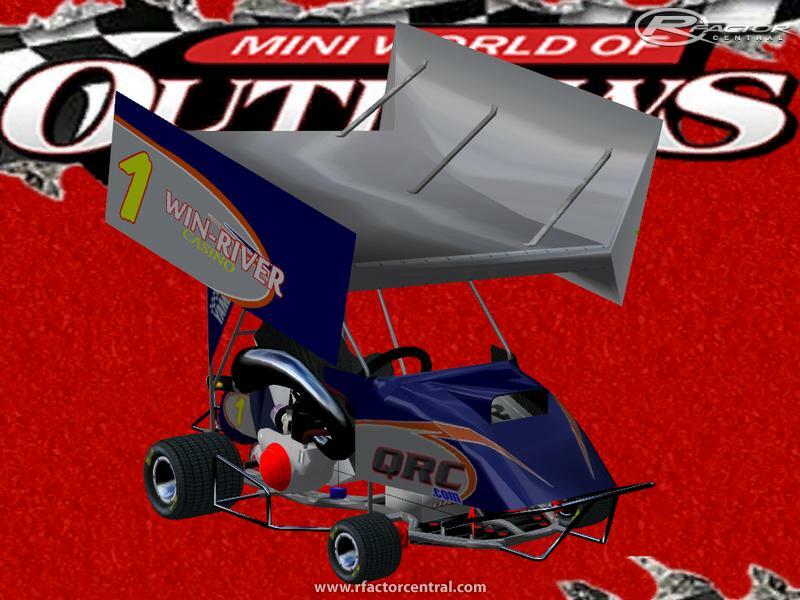 As you can see, an Open Outlaw kart nearly doubles that in horsepower-to-weight ratio and is in all respects a real race car." 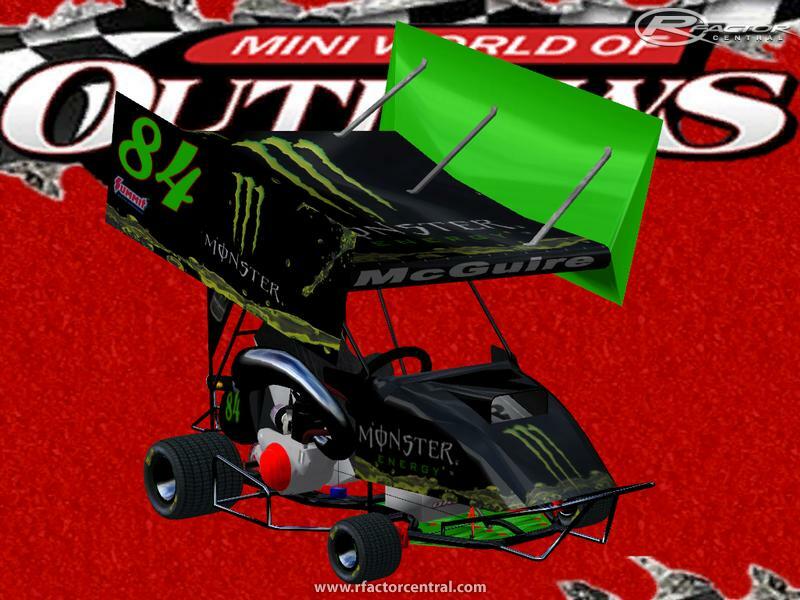 Paintable objects: bead locks, frame, cage, skid plate, air cleaner cover, gas tank lid, radiator lid, wing support brackets and of course paint scheme (body and wing) driver, and helmet. Setup Adjustments: steering lock, fuel load, carb jet size (in %), final gear ratio (gears 1-5 not adjustable), brake bias, brake pressure, stagger, right rear spaceing, wing angle, front camber (-2 to 2 degrees max), and tire pressures. After initial release, will start to work on other classes (box stock, and intermediate) as well as various upgrade options (bead plates, different chassis like the QRC downtube chassis, RFC & SGC chassis, engine choices, etc.). Some other various models will be updated as well. Models: dingdingbraa exceptions: driver and helmet used from ISI's rFactor Hammer mod, tires from Bill @ BoZ (with permission, thanks Bill) and Major C from KDSR for the rear tail (with permission, thanks Major C). Pace car (quad) from some free 3d model site (I forgot where, but if I remember, I will post credit where it's due). Pace quad driver from BoZ pace truck. 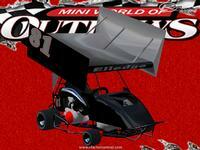 Physics: modified from BoZ Sprint Cars 2010 (with permission), but they turned out very different. 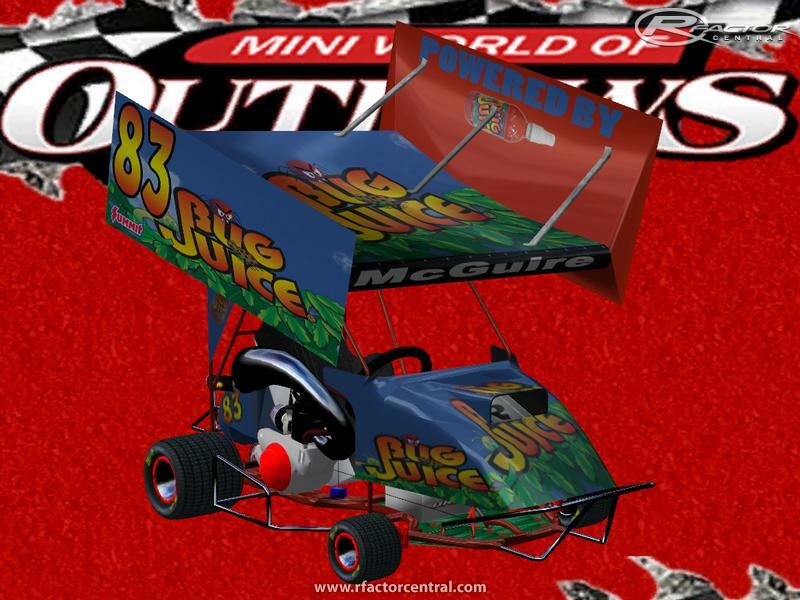 Beta Release skins: Gary McGuire, Ryan McGuire, Dave Albitz (Keystone Krew), Brian Bowling (Monster Army), and converted BoZ sprint car skins (not painted by me). This is my first attempt at modding so be patient, I want to drive these things as much or more than you do!! 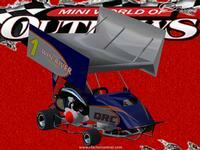 There are currently no setups for Mini World of Outlaws Beta. Add a Setup. 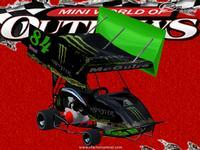 There are currently no car skins available for Mini World of Outlaws Beta. If you are a painter you can share skins for this mod via the Car Skins area. Visit the Spray Booth for painting tips & tricks. why does these cars hover over the ground online? doesn't how do I fix this? how can iget the mod to work because i try 3 times and it did't work this ?